"The Essential Minister that Purged the King’s Court 清侧重臣 (qīng cè zhòng chén)"
Where Wei had Deng Ai 邓艾, Shu had Jiang Wei 姜维, Wu had Ding Feng! A general that ascended from very bottom, he first made his career as a captain under Gan Ning 甘宁. He was usually assigned to unimportant missions along with Xu Sheng 徐盛, such as chasing Zhuge Liang 诸葛亮 at the Battle of Red Cliffs. However, in the late years of Wu Kingdom, Ding Feng climbed up the ranks incredibly fast. At his peak, he went from being a soldier to a minister of Wu Kingdom. He achieved two important accomplishments. One of them was the Battle of Dongxing 东兴, in which Ding Feng resisted the invasion of Wei Kingdom, lead by Sima Zhao司马昭. The second one was purging Sun Chen 孙綝, a vile regent that created pandemonium in the Wu Kingdom. Alas, arrogance got the better of him and he was eventually exiled for his military failures in his later years. Character ability 1: " Close Combat 短兵 (duǎn bīng) "
Whenever you use an ATTACK 杀, you can pick one additional player within your physical distance of 1 as the target of the ATTACK. 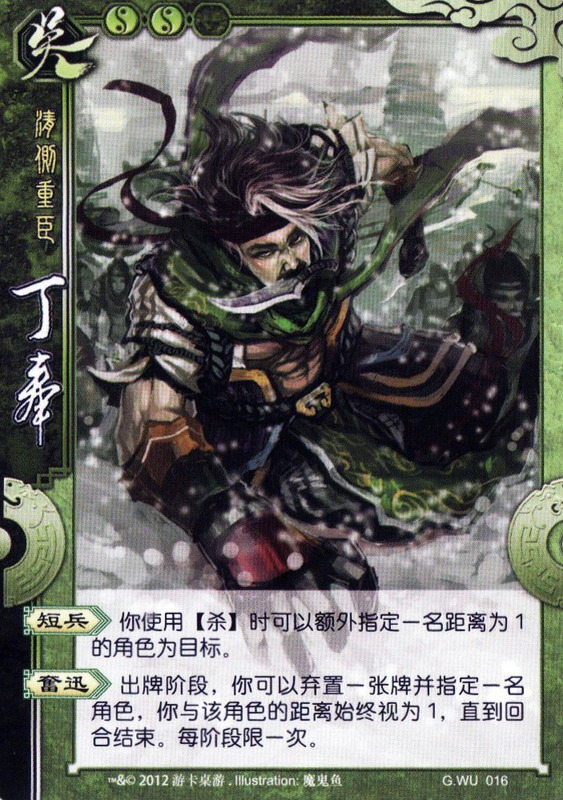 Character ability 2: " Swift and Deadly 奋迅 (fèn xùn) "
During your action phase, you can discard a card and select a player. The physical distance between you and that player is viewed as 1 till the end of your turn. Limited to once per phase. He is a brand new character specially created for Kingdom Wars. Both “Close Combat” and “Swift and Deadly” came from the Battle of Dongxing. Learning the death of Sun Quan 孙权, Sima Zhao, the second son of Sima Yi 司马懿 and the de facto leader of Wei Kingdom, led a vast army to invade Wu Kingdom. In order to surprise raid the camp of the Wei force, Ding Feng ordered his subordinates to withdraw their heavy armour, rushing in the snow to defeat the Wei force using only short sabers. 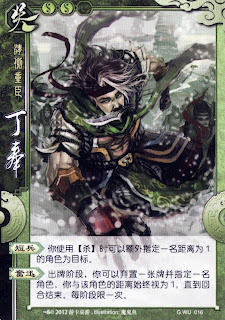 In the game, Ding Feng can withdraw his heavy arms (discard a card) to approach his enemies, devastating his enemies with “Close-quarter Combat”.